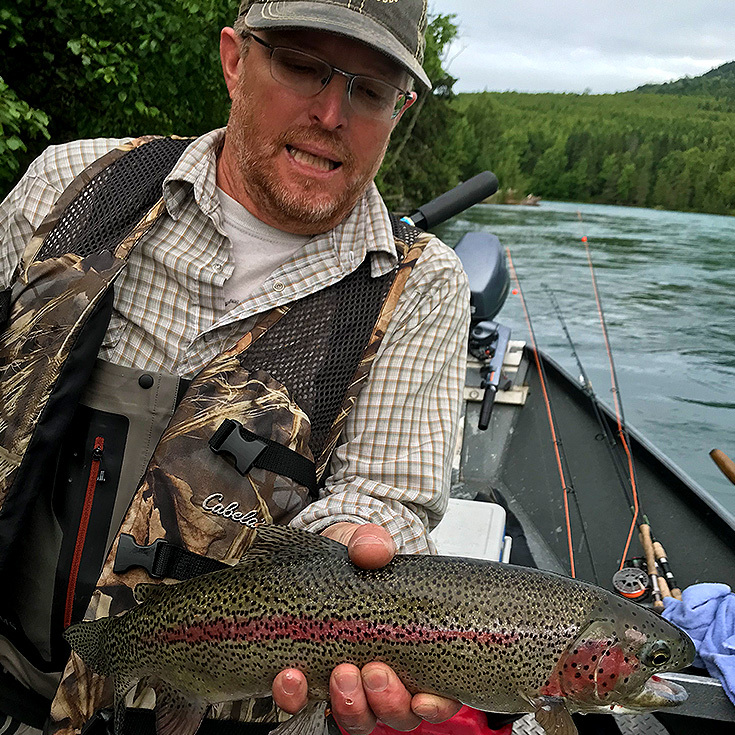 Trout measuring 18-24 inches are not uncommon here and every year, some lucky angler or two lands a behemoth Kenai River ‘bow approaching (or exceeding) the twenty pound mark! Go ahead-travel to New Zealand, Chile, Argentina or more remote (and expensive!) parts of Alaska. 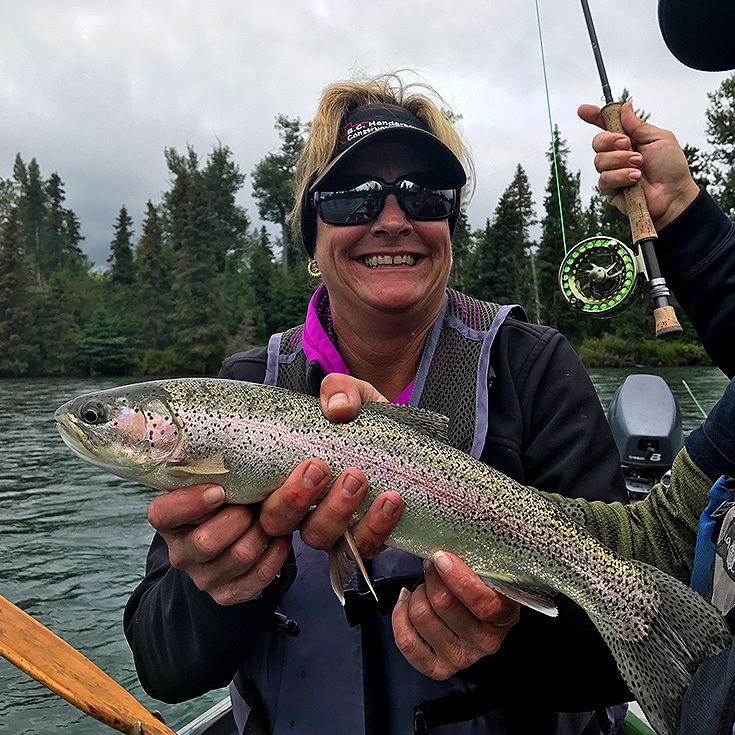 You will be hard pressed to find a more reliable, higher success, and less expensive trophy trout fishery than the Kenai River. Colorful Dolly Varden Char will be caught in equal abundance on this trout charter, making it a true “combo trip” if there ever was one! Fishing for Rainbow Trout is good from mid-June thru July…but once August arrives and the salmon start to spawn, look out! The action really picks up, improving each week through September (and even October, for those hearty enough to handle the weather). We offer three distinctly different charters for our trophy trout anglers. Working from the headwaters of the river down, the first is called the Upper Kenai River. It is a quiet, drift boat trip in a non-motorized section of the river. The upper Kenai River is regulated as an artificial, single hook only fishery that is 100% catch and release. This section of the river is easily accessed, and although beautiful, occasionally runs alongside the Sterling Highway. Our guests use spinning rods or fly-rods, and if you’ve always wanted to learn how to fly-fish, this is the perfect time, since our guides are true trophy trout specialists that are extremely knowledgeable and patient. You will drift fish from the boat, and occasionally get out on a gravel bar to work attractive slots and runs. Just downstream from the upper section is what locals call the Kenai Canyon, due to its high rock walls and class III whitewater. This is the most remote section of the 81 mile river and thus our most popular trout trip. You will see no powerboats, no homes, no cars, no roads-it is simply a gorgeous section of trout filled water. Fishing is similar to the upper river and you can choose a fly or spinning rod and drift from the drift boat while occasionally visiting the bank. For this reason, you will need hip boots or chest waders on these two sections. Our guides can provide loaner hip boats if you don’t have your own. 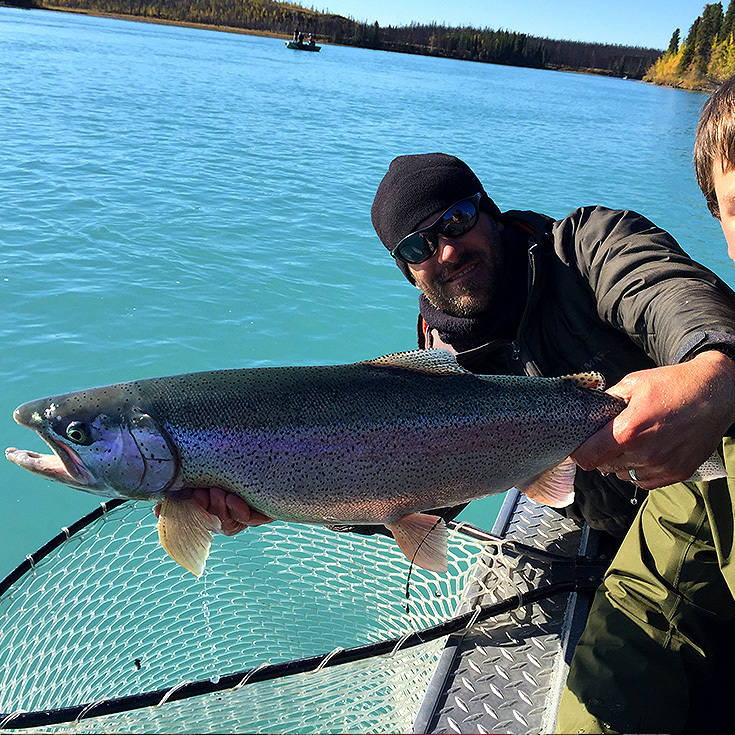 Like the Upper Kenai, on this trip you can expect to land 25-100 trout per boat during peak season! This trip is logistically challenging but well worth the added hardship and cost. The third and final trophy trout trip we offer is via power boat on the middle Kenai River. Launching at Bing’s Landing, you will travel upstream until you near the outlet of Skilak Lake; at which point your veteran guide will turn the boat sideways, instruct you to cast your single egg imitation or flesh fly, and hang on! As you drift downstream, you will know it when a dolly or rainbow grabs your offering! Land your fish in a rubber basket net, take a quick photo, release it, and run back up river to do it all over again! frequently, and are marked as well as any native rainbow on the planet! One thing’s for sure, if you book a trophy trout trip with EZ Limit, you better bring your tape measure and your camera, because you are going to need both!